The 2018 construction season will soon be here, and Lennox & Addington County will be undertaking a number of large road and bridge projects that will benefit all residents within the County. 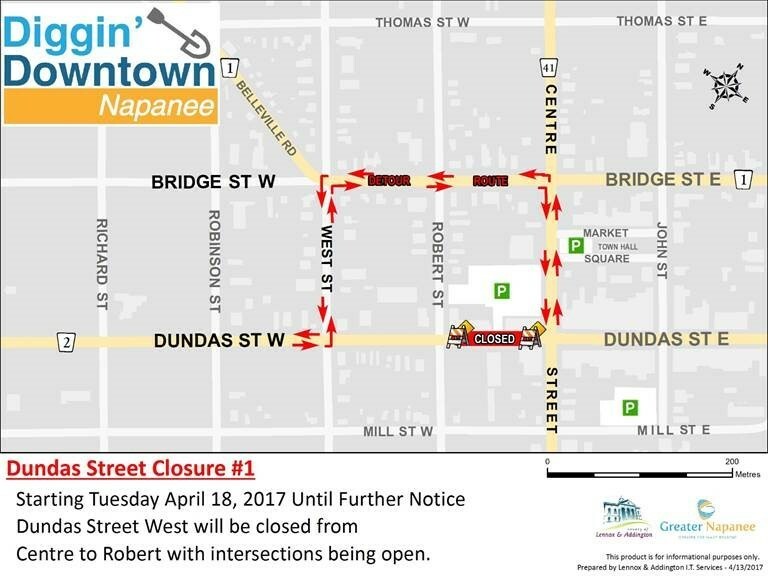 Effective Monday, May 1st, the intersection of Dundas Street and Centre Street and the intersection of Dundas Street and Robert Street will be closed to traffic. This is required to facilitate the set-up and operation of the required pumping equipment so crews can install the new sanitary, storm, and watermains within the block. The underground work is scheduled to be completed mid-June. The surface restoration work will follow immediately afterwards with the intent to re-open the intersections prior to the July 1st (Canada Day) weekend. Contractor chosen for Phase 1 of "Diggin' Downtown Napanee"
The County of Lennox & Addington and the Town of Greater Napanee are pleased to announce that Len Corcoran Excavating (LCE) has been chosen as the contractor for Phase 1 of the Dundas Street Reconstruction Project, otherwise known as “Diggin’ Downtown Napanee”.